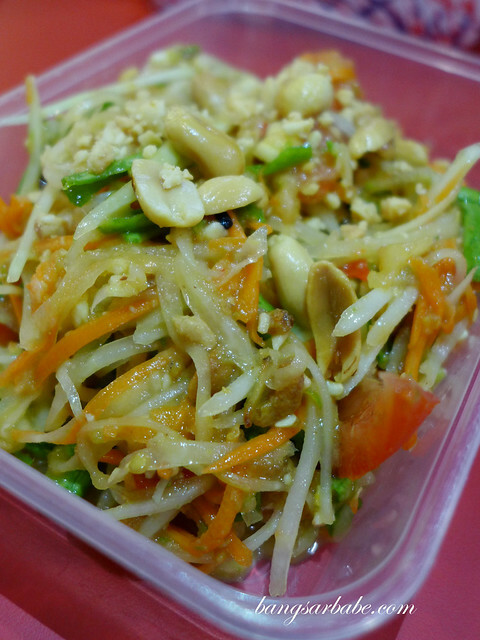 My first Thai mango salad was in Bangkok, where I sat by the roadside along the stretch of Sukhumvit. The lady used a mortar and pestle (batu lesung in Malay) to pound and mix the salad — it was robust, spicy and tropical. Hwan’s version is currently the closest to that. This was assembled upon order and each mouthful was fruity, nutty and fiery. 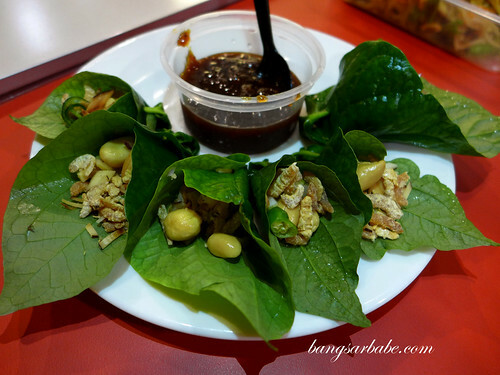 Mieng Kam means “eating many things in one bite” and the process involves wrapping bits several items in a (wild pepper) leaf, topped with a sweet-savoury sauce. Hwan does it for you so you don’t need to get your hands dirty. All you need to do is top the mix with some sauce and chew, for a tingling, tasty experience. The Mango Sticky Rice comes with half a mango and four colourful rice balls, drizzled with sweet coconut cream for a visual play. While I would have preferred a sweeter mango, this was still pretty tasty and of (good) value for money. Mee Krob is a Thai snack of sweet sour crispy rice noodles. Very light and pleasant to eat, but not a favourite of mine. 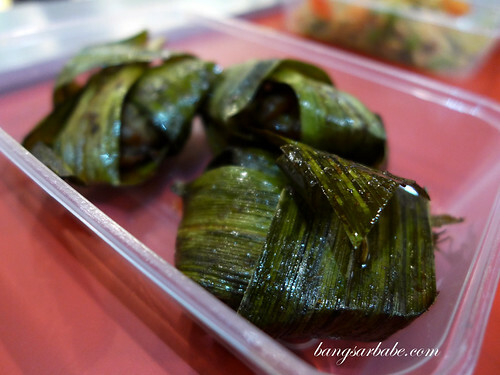 I preferred the pandan chicken as the meat was well marinated and tasty throughout. Perfect for snacking. 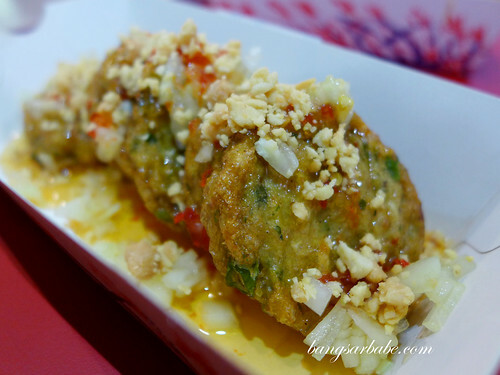 Another winner was the Thai Fish Cake — thick pieces of fish patty with Thai chilli sauce, chopped onions and nuts. 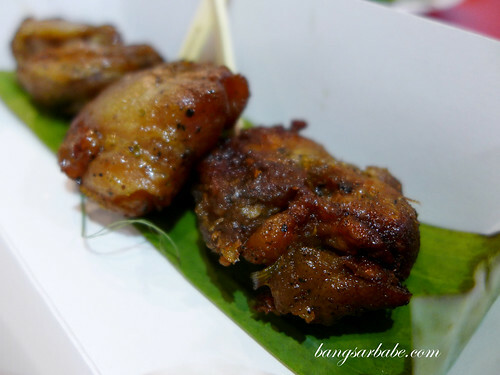 Each bite was springy and full of ‘bite’; I found this very addictive. 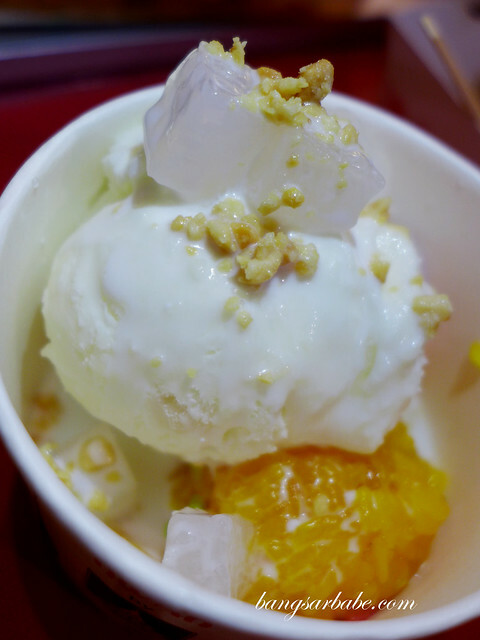 Hwan serves one of the better and more affordable red ruby desserts I’ve tried. 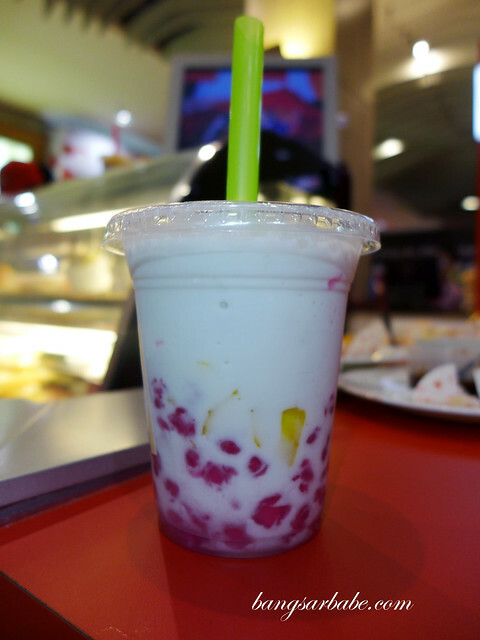 Each cup comes with a generous amount of chestnut (red ruby) and jackfruit. That said, I prefer the ice shavings to be a bit finer for a smoother slurp. 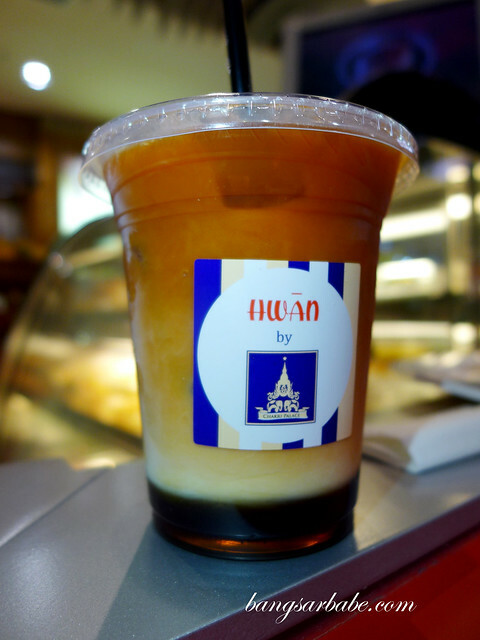 The Thai Ice Tea has a good balance of tea and milk. Many places I know serves you a cup full of sugared water and very little tea. But Hwan’s version struck a good balance. rif and I were quite pleased with this. 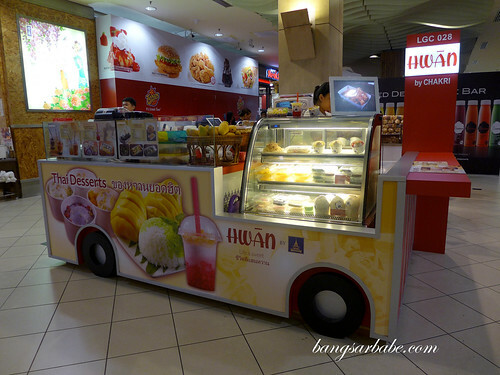 I was told Hwan (pronounced ‘wan’) is the first dessert and snacks concept kiosk in Malaysia, and it started when Caleen was introduced to an authentic Thai street dessert stall when she visited this Thai dessert stall, an hour away from Bangkok. 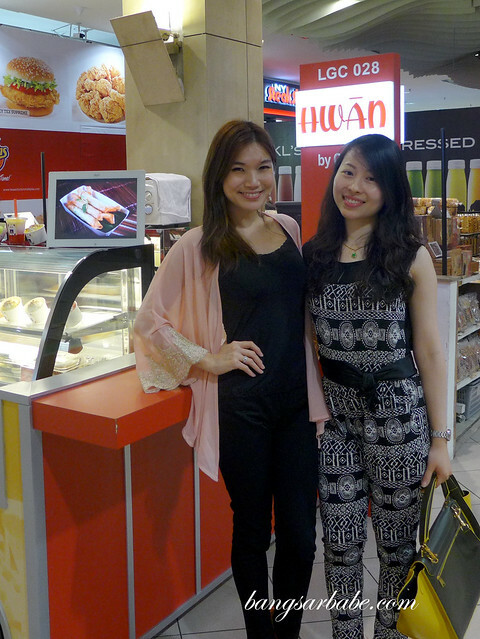 The place was no-frills but the snacks and desserts inspired her to open a similar concept in Malaysia. Thus Hwan was born. Prices are very affordable and the snacks and desserts I tried were good. 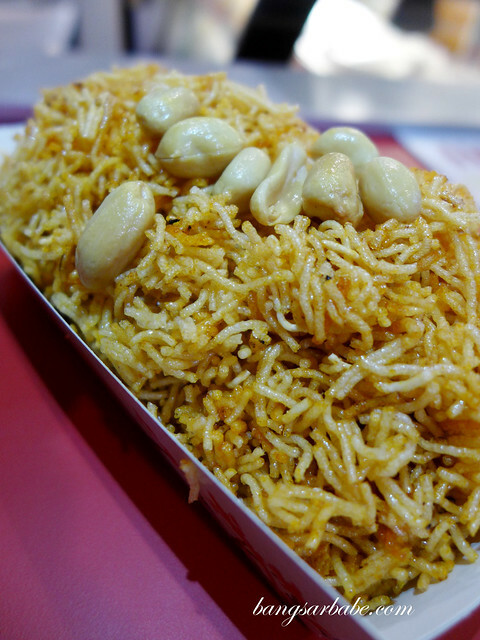 They brought back good memories of my times in Bangkok, where I thronged the street food stalls and tucked into cheap and yummy treats in the city. 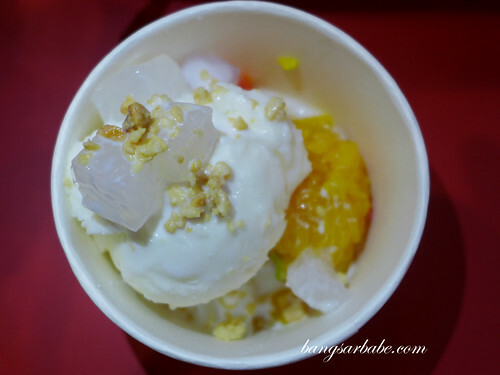 Verdict: Give the mango salad, coconut ice cream and red ruby a try! 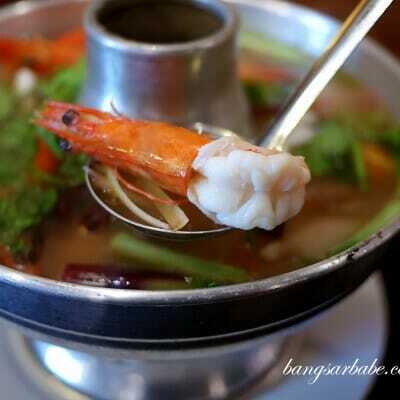 I love Som Tam and that pic right there that looks legit. I will most definitely try the next time I’m at Midvalley. Great rec thank you !